Denmark, 1950s This armchair by Hans Wegner for GETAMA, known as the cigar chair, features a solid oak frame with original spring cushions and upholstery. Denmark, 1953 Classic Model 250 Valet or Bachelor’s chair by Hans Wegner. Denmark, 1970s This chair was designed by Hans Wegner and manufactured by Getama. 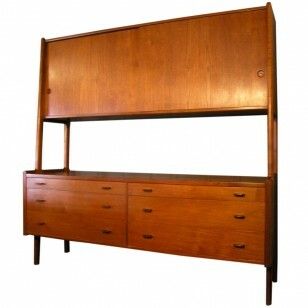 It is constructed of a stained oak frame and features the original upholstery. The headrest is attached to the chair back with leather straps. Denmark, 1960s The Keyhole rocker was designed in 1967 by Hans Wegner for Getama. This example features an oak frame in excellent original condition, the original canvas seat, and a new leather headrest bolster. 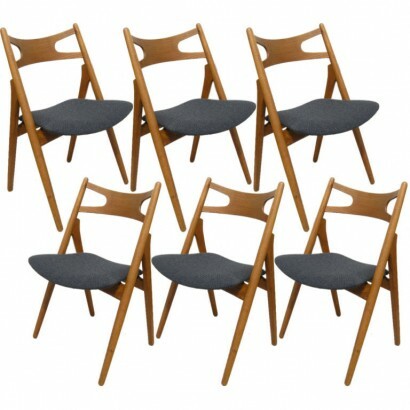 Denmark, 1950s Designed in 1950, these lovely easy chairs are simply but beautifully constructed of oiled oak and paper cord. Denmark, 1950s Designed in 1951 by Hans Wegner, this armchair features an oak frame and the original red wool upholstery. Denmark, 1960s This Papa Bear chair by Hans Wegner was reupholstered previously in light grey wool and is in excellent vintage condition. Denmark, 1960s This armchair by Hans Wegner for Getama, known as the cigar chair, features a solid oak frame with original spring cushions and upholstery. Denmark, 1950s Designed by Hans Wegner for GETAMA in the fifties, this solid oak coffee table provides a generous surface space that expands to 62 inches when the curved drop leaves are extended. Denmark, 1947 This iconic design, an exaggerated take on the classic Windsor chair, is Hans Wegner’s first well-known piece. Signed with manufacturer’s mark on underside of seat. 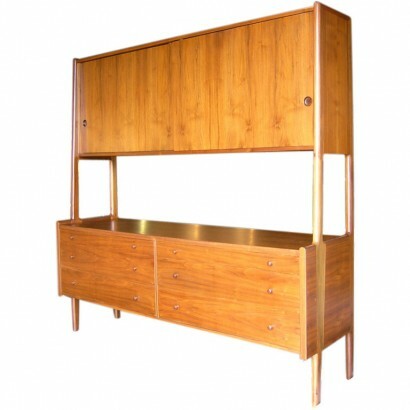 Denmark, 1947 This classic design is Hans Wegner’s first well-known piece. 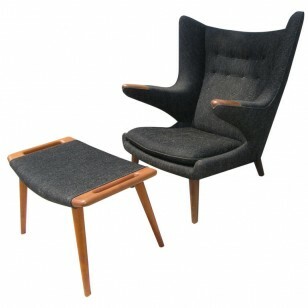 Denmark, 1950′s Beautiful chair in excellent condition. Denmark, 1951 The classic CH-28 armchair was designed by Hans Wegner in 1951 and was one of the first five designs he created for Carl Hansen & Son. This Sawbuck armchair is upholstered in original leather and is extremely comfortable. Denmark, 1950′s Excellent. 2 small holes on the back for wire access. 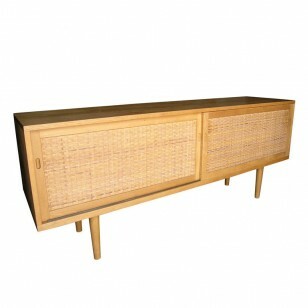 Denmark, 1950′s This rare solid oak sideboard by Hans Wegner features beautiful sliding rattan doors. Adjustable shelving on the left and adjustable felt-lined sliding trays on the right. 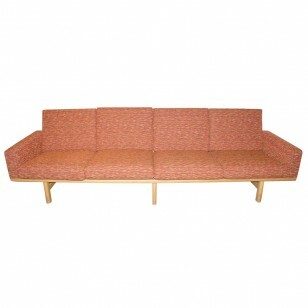 Denmark, 1940s This classic rocker by Hans Wegner comes with a custom-made cushion. 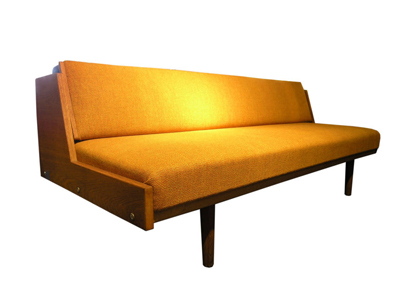 Danish, 1964 This Hans Wegner daybed has an oak frame with upholstered backrest that lifts up and locks in place to allow for use as a twin bed and to reveal a bedding storage area. Reupholstered with vintage textile.